Don’t forget those body parts! You’ve lived a lifetime, but no-one could ever tell by looking at your face. Congratulations! You’ve fooled everyone… and then they get a glimpse of your hands. Your secrets out, so what’s a girl to do? Why not try an at-home treatment such as AB Hands. It contains 15% glycolic acid which is strong enough to eliminate age spots and fine lines, even out hyperpigmentation and discoloration, lighten scars, and reverse sun damage. And since sunscreen is a must, use AB Sun to protect against harmful UV rays and to moisturize. Thankfully, you’ll see results in as little as 1-2 weeks so your secret will be safe again. 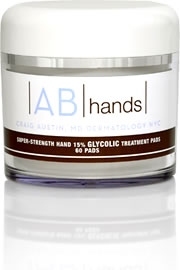 AB Hands, ABskincarestore.com, $95. Just like the rest of our bodies, the earlobes go south during the aging process and can be further damaged by constantly wearing earrings. New York plastic surgeon, Dr. Robert A. Guida, injects Restylane, a popular hyuarlonic acid filler that is used on the face to smooth out wrinkles, to perk up drooping ear lobes. The results last up to two years and the starting cost is approximately $400. So, take out those chandelier earrings and show your ears off! this is a super site! i like the tips! i like products like these that give away free stuff! same with nbeauty.biz, you just email them and they sent me full size product samples. so cool.thanks.